Dipentene Market size was more than USD 1.2 billion in 2017 and will witness 4.6% CAGR during the forecast timespan. Global dipentene market is primarily driven by personal care products and food & beverages business across the globe. The product is used as a flavoring and fragrance additive in both the end-user industries. The citrus aroma of the product makes it a desirable choice for food processing companies. Moreover, the product has found widespread application as an ingredient in various cosmetic formulations and personal hygiene care products. Limonene market will substantially grow as a green solvent replacing petroleum-based solvents in industrial and paints & coatings applications in the coming years owing to its bio-degradability and low VOC emission. The market has immense potential to be explored as alternative to mainstream pesticides, owing to its versatile characteristics. Dipentene has low level of toxicity according to the U.S. EPA. The risk of health effects following repeated limonene exposure is likely to be high during end use of the product in confined spaces and in places with limited ventilation. These factors are likely to hamper dipentene market size growth during the forecast timeframe. Additionally, the possibilities of manufacturing bio-based plastics and polymers with dipentene is being explored by many multi-national companies, which has surged product demand in past few years, ultimately resulting in high product prices for both food as well as technical grade applications. Dipentene is sold across continents in majorly two grades; food and technical. Technical grade is also known as industrial grade in different regions. Technical grade will be the fastest growing segment amongst the two in the coming years. It can be attributed to its application in various end-user industries such as paints & coatings, household cleaning, rubber, chemicals, electronics, etc. The product is increasingly becoming preferred choice in paints industry, where the end-user is marine vessels. General cargo tankers, submarines, ships are drifting towards paints & coatings which are aquatic life friendly. Enamels and lacquers made from petrochemicals emit VOC in water that causes water pollution and poses threat to aquatic animals. Varnishes and paints made from technical grade dipentene will be a green alternative to these conventional paints and help in reducing water pollution. Food grade held the largest share in global dipentene market in 2017 due to its particular citrus aroma which makes it an active ingredient for essential oils. Food grade dipentene is also used in making various drugs owing to its antioxidant and anti-inflammatory properties. The expansion of hypermarket and supermarket retail format has driven demand for processed food and drinks. Consumers are actively looking for foods that are mostly ready-to-eat and healthy also. This drifting trend has created demand for pool of products which are processed with natural ingredients. This shall create elevated food grade demand for dipentene in the coming years. Chemicals accounted for the largest share in global dipentene market in 2017. Dipentene has numerous applications in chemical industries and other manufacturing plants. It includes its use as a chemical intermediated, degreaser, cleaner and solvent. Dipentene can be used as release agent which can be sprayed on asphalt trucks’ beds before picking loads for easy unloading. Paints & coatings application has enormous demand in automotive and construction sector. It is also witnessing rising demand from marine vessels industry. Paints & coatings are necessary to new as well as recycled components/machines or parts. Dipentene is used as a fragrant alternative to turpentine, and also as a paint stripper. Most paint formulations use a combination of solvent carriers to spread the product over a desired area. Generally, dipentene can be used as the carrier as an alternative to other petroleum-based solvents, often with resulting in reduction in volume of solvent used. North America was the largest region in global dipentene market in terms of volume and value in 2017. U.S. is among the top 10 citrus fruit producers in the world, hence a large volume of fruits is processed to yield limonene and other fruit oils which are used in various personal care products. Dipentene is widely used in cosmetics such as moisturizers, sunscreen, skin care creams, lipsticks, etc. and U.S. is home to some chief cosmetic producers in the world. Consumers in the U.S. are more aware about the benefits of natural ingredients in cosmetics and have preferences shifting towards bio-degradable products, which will be a prime driver in propelling product demand in the coming years. Asia Pacific will grow at substantial rates in the coming years due to rising citrus fruit production in China, India, Indonesia, Malaysia, etc. The dipentene production shall witness significant increase in terms of volume due to increasing production plants of multi-national companies which have planned product penetration in these countries. Sturdy growth of end-user industries of dipentene in Asia Pacific will positively influence product demand during the forecast timeframe. The dipentene market is highly competitive with major players holding more than 50% of market share in 2017. 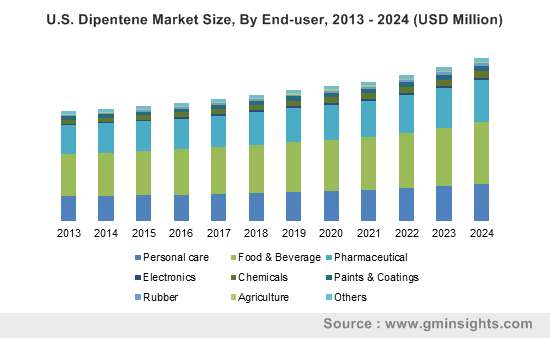 The key market share contributors in dipentene industry include Florida Chemical Company, Fujian Green Pine Company Limited, Mangalam Organics Limited, Florachem Corporation and International Flavors & Fragrances Inc. 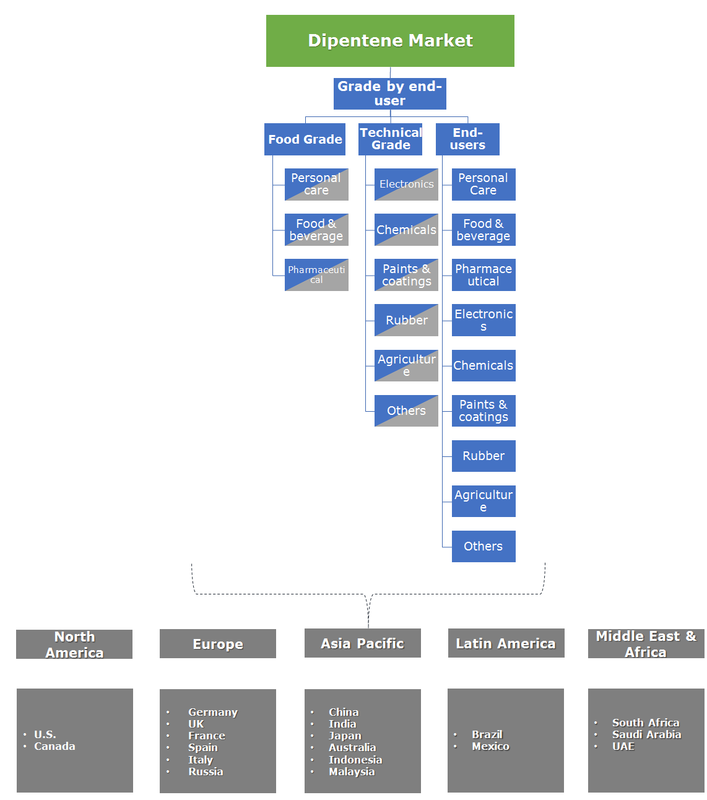 The companies involved in limonene business have mergers & acquisitions as their prime expansion strategy. In addition, switching cost for suppliers is very low in the industry. This makes the market more competitive by decreasing entry barriers for the new entrants. Producers are expanding their manufacturing capacity and majority have their own distribution network. Dipentene, which is also known as a limonene is an optically active terpene having a lemon like aroma found in orange, peppermint, lemon and other oils. The product is used as wetting agent in paints & coatings and in resin production. Its formula is C10H16. Limonene is a naturally occurring derivative which is biodegradable and nontoxic in nature. Owing to its less toxicity and environment friendly attributes, it has low threat of substitution. Growing paints & coating industry along with agricultural sector will fuel limonene market expansion at significant growth rate over the forecast period.